On a motorway, when should the hard shoulder be used? 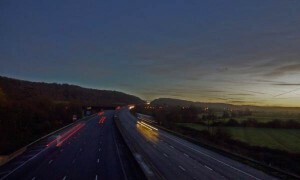 On a motorway, when should the hard shoulder be used? This guide is about driving safely on motorways and is for all vehicles. It includes important knowledge from the Highway Code that you will need in your theory test. A motorway is a multi-laned road with traffic separated by a central reservation. Provisional licence holders are not allowed to drive on a motorway. When you’ve passed your practical test ask your instructor to take you for a lesson on the motorway. You’ll need to get used to the speed of traffic and how to deal with multiple lanes. The Pass Plus scheme has been created for new drivers, and includes motorway driving. Ask your ADI for details. Motorbikes under 50cc are not allowed on the motorway as they are not capable of keeping up with the traffic flow. Learner drivers, tractors, horses and cyclists must not use motorways either. Vehicles towing trailers are not allowed in the right-hand lane of a three-lane motorway. Motorways will sometimes have crawler lanes on the left for slow vehicles so that they don’t hold up the flow of traffic up steep hills. If you see a crawler lane sign you can expect a long uphill gradient and you should be prepared to change down a gear or two to maintain your speed. 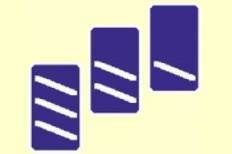 When joining a motorway you have to give way to other vehicles already on the motorway. Match your speed and signal your intention so that other drivers know what you are doing. Merge like a zip, i.e. one car from the slip road, one car already on the motorway, one car from the slip road, one car already one the motorway, and so on. If you are travelling along the motorway and see traffic entering from a slip road, move to the middle lane until you are past the slip road, then move back if you are not overtaking vehicles. If you are travelling at the same speed as the merging traffic, let them merge like a zip. You must only use the right-hand lane of a motorway for overtaking other vehicles, unless you are directed there because there’s an accident, emergency or roadworks. You must not overtake on the left unless traffic is in slow-moving queues and your queue is moving faster than the one on the right. When you want to overtake from the left lane check over your shoulder in the far right lane in case any traffic is moving back into the centre lane which is where you want to move to. Highways Agency Traffic Officers are allowed to stop and direct anyone on a motorway. Highways Agency Traffic Officers (HATOs) are able to stop and direct traffic on most motorways and some ‘A’ class roads. They work in partnership with the police at motorway incidents and provide a highly trained and visible service. Their role is to help keep traffic moving and make your journey as safe and reliable as possible. They are recognised by an orange and yellow jacket and their vehicle has yellow and black markings. If you see the following sign it will be on the back of a road safety vehicle and you can pass on its left. The only time you are allowed to stop on a motorway is in an emergency or breakdown, if directed to by a Highways Agency Traffic Officer/police officer, or if red lights show in every lane (in which case you must stop). While vehicle traffic might come to a standstill in a traffic jam, you must not leave your vehicle. If you have a breakdown or a puncture try to guide your vehicle to the hard shoulder. If you can’t and you end up stranded in a lane, turn on your hazard warning lights. You can only stop on the hard shoulder in an emergency. You are not allowed to use the hard shoulder as a lane unless variable traffic signals advise of it via an Active Traffic Management scheme, and you are not allowed to stop on the hard shoulder to answer your mobile phone. Due to the danger from passing traffic you should park as far to the left as you can if you have a breakdown or puncture and leave the vehicle by the nearside door. Do not attempt even simple repairs. Instead walk to an emergency telephone on your side of the road and phone for assistance. While waiting for assistance to arrive wait near your vehicle, keeping well away from the carriageway and hard shoulder. To find the nearest emergency telephone walk to the nearest marker post. They are 100m apart and will show you the direction of the closest one. When you are using an emergency telephone on the motorway you should always face traffic so that you can see any dangers coming. Traffic is passing you at speed. If the draught from a large lorry catches you by surprise it could blow you off balance and even onto the carriageway. By facing the oncoming traffic you can see approaching lorries and so be prepared for their draught. You are also in a position to see other hazards approaching. Emergency telephones are sometimes linked to the police and sometimes to a Highways Agency control centre. They are often better to use than mobile phones because they can provide an exact location to police and highway agencies because each phone has a unique number. An Emergency Refuge Area is an area on a motorway for use in cases of emergency or breakdown. Emergency Refuge Areas may be found at the side of the hard shoulder about 500 metres apart. If you break down you should use them rather than the hard shoulder if you are able. When re-joining the motorway you must remember to take extra care especially when the hard shoulder is being used as a running lane within an Active Traffic Management area. Try to match your speed to that of traffic in the lane you are joining. After a breakdown you need to rejoin the main carriageway of a motorway from the hard shoulder. You should gain speed on the hard shoulder before moving out onto the carriageway. Indicate your intention and try to match the speed of traffic on the motorway, but don’t force your way in; wait for a gap. If traffic has slowed suddenly, use your hazard warning lights to warn drivers behind you so that they don’t run into you. Contraflow systems could be used on motorways when repairs are needed, or if there’s a serious accident that blocks the motorway. In this case you should slow down and leave plenty of room to the vehicle ahead. 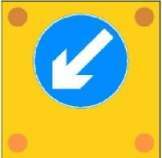 Signs such as the one below might instruct you that a lane is closed. The following sign means that all lanes are closed. And this sign means that the right-hand lane is closed. This sign means the end of a restriction such as a lane closure. 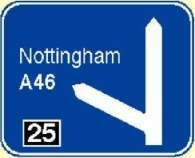 This sign means that you must leave the motorway at the next exit. The speed limit on a motorway for cars and motorbikes that aren’t towing a trailer is 70mph in any of the lanes. Heavy vehicles and vehicles towing trailers are restricted to 60mph. Variable speed limit signs are used to reduce traffic bunching, which improves the overall flow of traffic on the motorway. Congestion can be reduced by keeping traffic at a constant speed. At busy times maximum speed limits are displayed on overhead gantries. These can be varied quickly depending on the amount of traffic. By keeping to a constant speed on busy sections of motorway overall journey times are normally improved. Active Traffic Management schemes are intended to reduce congestion and make journey times more reliable. In these areas the hard shoulder may be used as a running lane to ease congestion at peak times or in the event of an incident. It may appear that you could travel faster for a short distance, but keeping traffic flow at a constant speed may improve your journey time. A mandatory speed limit will be displayed above the lanes, including the hard shoulder. If a red cross is shown above the hard shoulder you must not use it as a lane and it should only be used for emergencies and breakdowns. The Actively Managed mode is set when all lanes show a speed limit on the gantries over the lanes. If a red cross is shown above the hard shoulder then you must not use it as a lane. Green reflective studs are found where slip roads join the motorway. Red reflective studs are found on the left hand side of the carriageway. White reflective studs are found between lanes on the motorway. Therefore in the left-hand lane you will have red studs on your left and white on your right unless you are passing a slip road in which case there will be green on the left; in the middle lane you will have white studs either side; and in the right-hand lane you will have white on your left and amber on your right. The exit from a motorway is indicated by countdown markers. These are positioned 90 metres (100 yards) apart, the first being 270 metres (300 yards) from the start of the slip road. Move into the left-hand lane well before you reach the start of the slip road. Motorway traffic travels at higher speeds, and advance signs warning of junctions are vital to enable you to be in the correct lane in good time to take your exit. 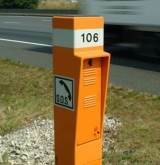 In most cases, one mile before the exit you will see a junction sign with road numbers. Half a mile before the exit the sign will also include the names of places accessible from that junction. When entering the motorway use the full length of the slip road to get up to speed and match the speed of the traffic already on the motorway. Don’t dawdle because if you try to merge with traffic when you are travelling slower than them you will cause them to brake and that will slow all traffic down. If you miss your exit you are not allowed to reverse back up the motorway – this is illegal. You must continue to the next exit. It’s also against the law to cross the central reservation or drive against the traffic flow on a motorway. When you intend to leave the motorway move into the left hand lane in good time so that you don’t risk cutting other drivers off. You can leave the motorway at rest areas and service stations if you are feeling tired and need to recharge or refuel.